Tourists can now book their tours online or offline and expect a fine whale watching experience in Cabo San Lucas. Cabo San Lucas, Mexico, January 10, 2019 --(PR.com)-- As the 2018-2019 whale watching season nears in Cabo San Lucas, Cabo Yacht World, a leading luxury yacht rental company in Los Cabos, has rolled out its whale watching tour program, officially starting from today. 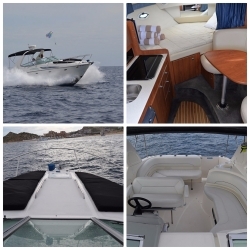 Customers can make their bookings online or offline and enjoy a fine whale watching experience on the company’s fully equipped luxury 32’ Bayliner Yacht. Both individual and group tours (of up to 13 people) can be booked. The program runs from November 15, 2018 to April 15, 2019. Every year, between autumn and summer, more than 1.5 million tourists set for the waters of Cabo San Lucas to treat themselves to one of the most unique whale watching experiences in the world. This is the time when the large cetaceans, including gray whales, humpback whales, sperm whales and blue whales, migrate from the feeding and frigid waters of Alaskato the calving grounds of Cabo, the Baja and the Sea of Cortez. Tourists can choose to race and chase these giant creatures,while managing a safe distance,or can simply stay back and behold their remarkable size and presence from deep calm waters. Like every year, the 2018-2019 whale watching season is also expected to bring lots of tourists to the coast, and the local luxury yacht rental companies are ready to serve them. Cabo Yacht World is a yacht rental service provider in Los Cabos, Mexico. The company organizes whale watching tours as part of its annual whale watching program. Running from November 15 to April 15, the program facilitates hundreds of customers every year. Customers can book their whale watching tours online or on phone, with the company’s customer support team always available for guidance. All tours can be customized as per the customer’s preferences. “We do everything in our capability to make sure your whale watching tour is as enjoyable and comfortable as it can be,” concluded the spokesperson. More details about the company and the whale watching tour in particular can be obtained by visiting the company’s official website. Cabo Yacht World has more than a decade’s worth of experience in nautical tourism in the Los Cabos region, Mexico. It offers a wide selection of luxurious yachts and fishing boats that come with the latest navigational technologies and tracking systems. The yachts are also equipped with professional crew, personalized chef and other necessities.